Pioneers in the industry, we offer cobalt accelerator from India. 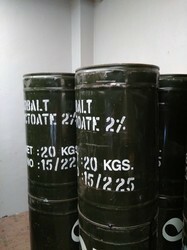 We offer superior quality Cobalt Accelerator for our customers with cobalt content that helps catalyst MEKP 50% in the polymerization of unsaturated polyester resins.We provide excellent quality Accelerants that can bond, mix, or disturb another substance, and cause an increase in the speed of a chemical process (natural or artificial). More generally, an accelerator can also speed cross-linking of polymer subunits or cause polymerization to occur at a lower temperature than normal.